Like most other European regions the actual territory of the Czech Republic has seen war in the past, and some of the well known moments of the world military history took place in either Bohemia, Moravia or Silezia, including the starting 1618–1620 campaign of the Thirty Years War (and the battle of White Mountain in 1620), decisive encounters between Austria and Prussia during the Seven Years War (1756–1763, and the defeat of Frederic the Great at Kolin in 1757), Napoleon’s most famous victory – Austerlitz (Slavkov) in 1805, and also one of his less known victories – the battle of Znaim (Znojmo) in 1809, and the defeat at Kulm (Chlumec) in 1813. One of the largest battles of the 19th century took place at Königgratz (Hradec Králové) in 1866 between Austria and Prussia and played a crucial role in the formation of the German Empire. About 1.4 million of Czechs were conscripted during the Great War between 1914 and 1918, serving the Austro-Hungarian emperor, and 300 thousand lost their lives; and about 90 thousand formed the Czechoslovak legions. The Second World War failed to start in 1938 with the Munich Agreement where shame has been chosen over war, and the war started a year later. About 45 thousand Czechoslovak soldiers than fought against the common enemy in the ranks of their western or eastern allies, and about 100 thousand resisted the occupation on the home front. Prague saw one of the most important and succesful operations behind enemy lines – the Anthropoid – during which the Czechoslovak paratroopers eliminated one of the highest ranking architects of Holocaust, Heydrich. All in all, the Czechoslovakia lost 365 thousand people, or 3.51 % of it’s pre-war population, most of them in the German death camps. Among the most important ones there is the Military History Institute (Vojenský historický ústav, VHÚ), a military institution, governed by the Ministry of Defence of the Czech Republic consisting of it’s headquarters and three specialized departments: the museum and administration department with the restoration section, the history and documentation department that manages also the military history library, and the operational/economic department. It’s research activities focus particularly on the issues of the 1st, 2nd and 3rd resistance (meaning 1914–1918 against the Austrian-Hungarian empire, 1939–1945 against nazi Germany, and 1948–1989 against the communist totalitarian regime), and the personal issues of top military personalities, and generally the Czech and Czechoslovak military history of the 20th century. The Military History Institute currently runs three large military museums, the National Monument to the Heroes of the Heydrich Terror, and in 2011 it opened a rich exhibition of arms and equipment in the Schwarzenberg palace in Prague. The Army Museum in Prague-Žižkov where the exposition is divided into three sections: Great War 1914–1918; the first Czechoslovak republic and its armed forces between the world wars; and the Second World War, the involvement of the Czech and Slovak people in the military operations, home resistance and other events aimed at restoring the independence of Czechoslovakia. Since 2003 the museum also displays the history of the 3rd (anti-communist) resistance. The exhibition shows weapons, uniforms, flags and banners, or personal memorabilia of important political and military leaders. The Aviation Museum in Prague-Kbely, located in the area of the first Czechoslovak air base built in 1918, belongs to the largest aviation museums in Europe, holding 275 airplanes, more than 100 are put on display in either five indoor halls or in the open air; 10 of the airplanes are fully operational. Among the displayed planes the visitor can find the French Spad VII fighter, the Czechoslovak pre-war Avia B-534 fighter, the Soviet Ilyushin Il-2M3 attack plane, the Avia S-92 which is a post-war Czechoslovak variant of the German Messerschmitt Me 262B jet fighter/trainer, the Avia S-199 Mezek, the post-war variant of the German Messerschmitt Bf 109G, exported to Israel in 1948, and many other rare and most interesting aircraft. The exhibition is completed with armaments, uniforms, figurines, banners of the Czech and Czechoslovakian Air Force. The Military Technical Museum in Lešany near Týnec nad Sázavou in Central Bohemia covers a large area of formed artillery barracks and displays over 350 military vehicles, weapons and equipment including tanks, armoured vehicles, trucks, self-propelled artillery, cannons, cars or motorcycles made since 1890. The vehicles are presented in 10 halls, 6 roofed parking areas and in the open air as well. Among the displayed pieces the visitor will find pre-war Czechoslovak light tanks, both LT-35 and LT-38, which were used at the beggining of the Second World War by the German Wehmacht during it’s invasion of Poland, France, Balkans and USSR; the German 15cm Nebelwerfer rocket launcher, the Soviet SU-76 or ISU-152 („zveroboy“ or „beast killer“)self-propelled AT guns, the US M4A1 tank (Sherman) and the M3A1 light tank (Stuart); in the roofed areas there are dozens of vehicles including the tanks used by the armies of the Warsaw pact like the IS-3, T-34/85, T-54/55, T-72, and from the western side the M48 or M60, and more, including the israeli Merkava I. 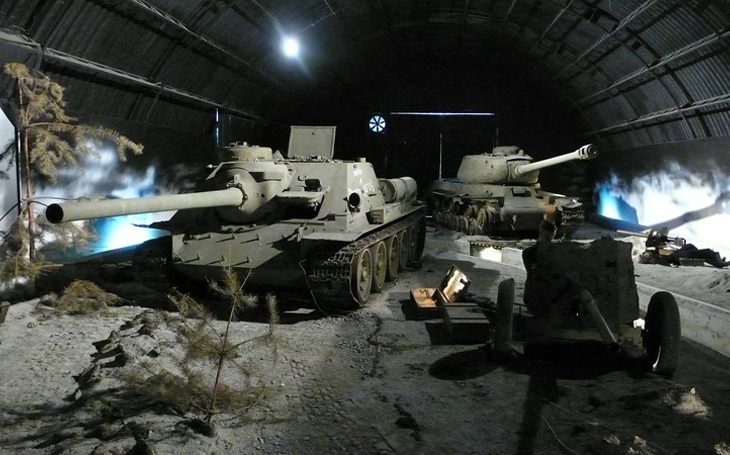 In Hall 6 the visitors enter a tank battle between the German and Soviet/Czechoslovak forces arranged with tanks (IS-2, T-34/85 and PzKpfW IV), AT guns and figurines. By the quantity and contents of its collection the museum is one of the most important military museums in Europe. The admission to all these three museums administered by the Military History Institute is free of charge, yet the Žižkov museum is currently closed due to reconstruction. The National Monument to the Heroes of the Heydrich Terror is located in the underground crypt of the Baroque Orthodox Church of Saints Cyril and Methodius, and it is a moving memorial to the seven Czechoslovak paratroopers who were involved in the elimination of Reinhard Heydrich in may 1942. The crypt is the place of the final fight (18th june 1942) of the paratroopers after their hiding place was revealed to the Germans by the traitor Karel Čurda. In the crypt the visitors can still see the bullet marks on the walls and signs of the paratroopers’ last desperate efforts to dig an escape tunnel to the sewer under the street. The exhibition covers also the aftermath of the operation Anthropoid and the nazi revenge, including the destruction and massacre of Lidice. In the attic of the Schwarzenberg Palace near the Prague Castle there is one of the permanent exhibitions of the Military History Institute: „The Imperial Armory“ which offers a unique collection of weapons, both firearms and melee weapons, military and hunting, armours, uniforms, head-gears, banners and more, dating from the 15th to the mid-19th century, and featuring over 550 items, not just of Czech origins, and not just of European origins. Among other museums dedicated to the modern military history there is the Military Museum Králíky in Pardubice region which displays many vehicles, weapons, military equipment and ammunition. Králíky and it’s surroundings were one of the most heavily fortified sectors of the former Czechoslovak-German boder in the 1930’s with three major fortresses, underground facilities, heavy infantry blocks and lines of pillboxes. Some of these can be visited. The Museum on the Demarcation Line in Rokycany is the biggest non-state museum in the Czech Republic. Its founder and operator is the Czech army land forces foundation. The museum is focused on vehicles and combat equipment, outfit and armament of the Czechoslovak army till 1938, the Anti-Hitler coalition and the German armed forces of the last days of the Second World War on the Demarcation (American-Soviet) line completed by the outfit and armament of the Czechoslovak People’s Army from the 1948–1989 era. The Military Museum Ořechov, near Brno, is part of the Army Park Ořechov, and is dedicated to the 1945–1989 period of our military history, and it displays weapons, equipment, uniforms and vehicles, some of those are still in operation. The battlefield of Königgratz (Hradec Králové) offers an exhibition dedicated to the War of 1866 between Prussia and Austria, located in the Museum in Chlum. The exhibition displays arms, uniforms and equipment used by both armies, and presents a natural starting point of your visit of the large historical battlefield which saw 50,000 killed soldiers, and also one of the last massive cavalry combats in history, commemorated by a moving momunent to the fallen horses, placed near Střezetice.